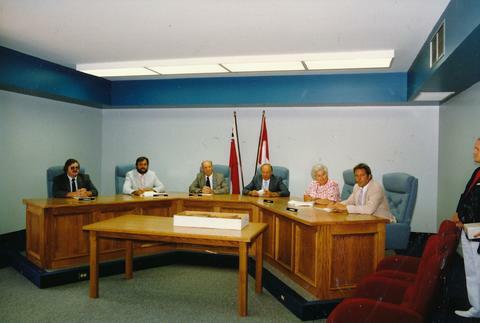 Council Chambers in the new Administrative Building for the Township of West Gwillimbury on August 12, 1989. The Councillors sitting behind the desk include Jim Corneau, Frank Jonkman, Charles "Bud" Brown, Art Janse, Frances Reid and Ron Simpson. Simcoe South MPP Bruce Owen is standing off to the right side.